Using WinDbg to debug Delphi processes can be both frustrating and rewarding. Frustrating, because even with the tools available to convert Delphi’s native .TDS symbol file format into .DBG or .PDB, we currently only get partial symbol information. But rewarding when you persist, because even though it may seem obscure and borderline irrational, once you get a handle on the way objects and Run Time Type Information (RTTI) are implemented with Delphi, you can accomplish a lot, quite easily. For the post today, I’ve created a simple Delphi application which we will investigate in a couple of ways. If you want to follow along, you’ll need to build the application and convert the debug symbols generated by Delphi to .DBG format with map2dbg or tds2dbg. I’ll leave the finer details of that to you — it’s not very complicated. Actually, to save effort, I’ve uploaded both the source, and the debug symbols + dump + executable (24MB zip). I’ve made reference to a few Delphi internal constants in this post. 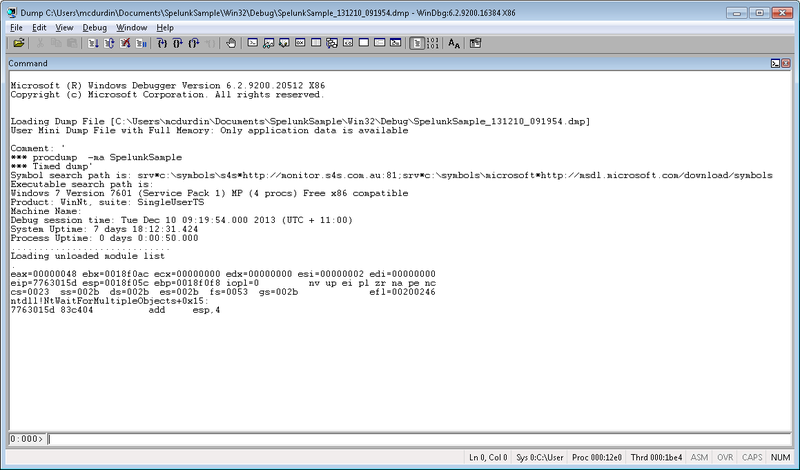 These are defined in System.pas, and I’m using the constants as defined for Delphi XE2. The values may be different in other versions of Delphi. 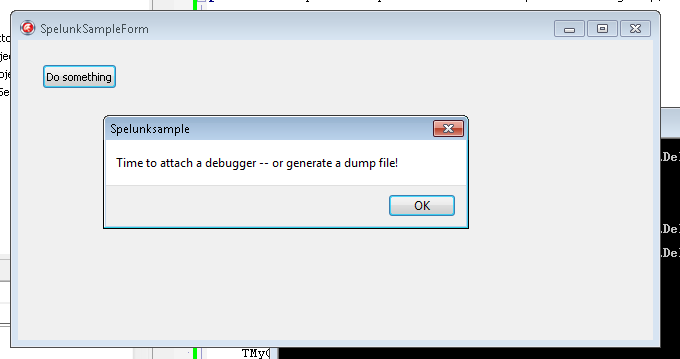 In the simple Delphi application, SpelunkSample, I will be debugging a simulated crash. You can choose to either attach WinDbg to the process while it is running, or to create a crash dump file using a tool such as procdump.exe and then working with the dump file. If you do choose to create a dump file, you should capture the full process memory dump, not just stack and thread information (use -ma flag with procdump.exe). Then I just fire up the SpelunkSample process and click the “Do Something” button. Next, I use procdump to capture a dump of the process as it stands. This generates a rather large file, given that this is not much more than a “Hello World” application, but don’t stress, we are not going to be reading the whole dump file in hex (only parts of it). Time to load the dump file up in Windbg. I want to understand what is going wrong with the process (actually, nothing is going wrong, but bear with me). I figure it’s important to know which forms are currently instantiated. This is conceptually easy enough to do: Delphi provides the TScreen class, which is instantiated as a global singleton accessible via the Screen variable in Vcl.Forms.pas. If we load this up, we can see a member variable FForms: TList, which contains references to all the forms “on the screen”. But how to find this object in a 60 megabyte dump file? In fact, there are two good methods: use Delphi’s RTTI and track back; and use the global screen variable and track forward. I’ll examine them both, because they both come in handy in different situations. Now we can search this memory for a specific ASCII string, the class name TScreen. When searching through memory, it’s important to be aware that this is just raw memory. So false positives are not uncommon. If you are unlucky, then the data you are searching for could be repeated many times through the dump, making this task virtually impossible. In practice, however, I’ve found that this rarely happens. 0:000> s -a 0400000 00b27000 "TScreen"
004f9302  54 53 63 72 65 65 6e e4-8b 4f 00 f8 06 44 00 02  TScreen..O...D..
0:000> s -a 0400000 00a80000 "TScreen"
Huh. That’s interesting, but it’s a sidetrack; we can see TScreen.Create which suggests we are looking at the right thing. There’s a whole lot more buried in there but it’s not for this post. Let’s go back to where we were. 004f8b8c  004f8be4 00000000 00000000 004f8c24  ..O.........$.O. Only two references. Why two and not one, given that we know that TScreen is a singleton? Well, because Delphi helpfully defines a vmtSelf metadata member, at offset -88 (and if we do the math, we see that 004f8be4 - 004f8b8c = 58h = 88d). So let’s look at the second one. That’s our TScreen instance in memory. In this case, there was only one instance. But you can sometimes pickup objects that have been freed but where the memory has not been reused. There’s no hard and fast way (that I am aware of) of identifying these cases — but using the second method of finding a Delphi object, described below, can help to differentiate. I’ll come back to how we use this object memory shortly. But first, here’s another way of getting to the same address. So, disassemble the first few lines of the function. Depending on the conversion tool you used, the symbol format may vary (x spelunksample! *substring* can help in finding symbols). The highlighted address there corresponds to the Screen variable. The initialization+0xb1ac rubbish suggests missing symbol information, because (a) it doesn’t make much sense to be pointing to the “initialization” code, and (b) the offset is so large. And in fact, that is the case, we don’t have symbols for global variables at this time (one day). But because we know this, we also know that 00524300 is the address of the Screen variable. The variable, which is a pointer, not the object itself! But because it’s a pointer, it’s easy to get to what it’s pointing to! Look familiar? Yep, it’s the same address as we found the RTTI way, and somewhat more quickly too. But now on to finding the list of forms! Let’s dump that TScreen instance out and annotate its members. The symbols below I’ve manually added to the data, by looking at the implementation of TComponent and TScreen. I’ve also deleted some misleading annotations that Windbg added. Yes, it’s our form! But what is with that poi poi poi? Well, I could have dug down each layer one step at a time, but this is a shortcut, in one swell foop dereferencing the variable, first to the object, then dereferencing to the class, then back 38h bytes and dereferencing to the class name, and plus one byte for that ShortString hiccup. Saves time, and once familiar you can turn it into a WinDbg macro. But it’s helpful to be familiar with the structure first! Your challenge now is to list each of the TMyObject instances currently allocated. I’ve added a little spice: one of them has been freed but some of the data may still be in the dump. So you may find it is not enough to just use RTTI to find the data — recall that the search may find false positives and freed instances. You should find that searching for RTTI and also disassembling functions that refer to member variables in the form are useful. Good luck!